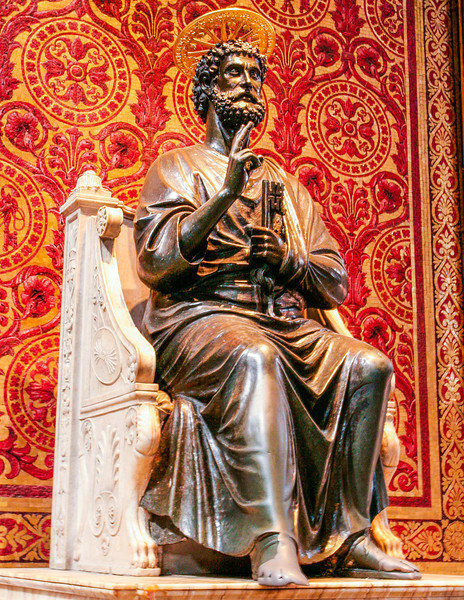 This is a bronze statue of St. Peter thought to have been made by Arnolfo di Cambio in the 13th century, although that's something that's often disputed by art historians and scholars who think it was cast as early as the fifth century. Either way, this St. Peter has seen a lot of love. It's tradition for people to kiss or rub his foot when they pass by. You can tell just how many people have done it by the fact that his right toes have worn into a completely smooth surface, whereas his left toes are still individual digits.